Gango Editions is busy turning out new prints to keep the market fresh and exciting. Every Wednesday we post new images at www.gangoeditions.com and update our Facebook page throughout the week with new art. Visit us frequently to see great art like this. You can download our New Releases Hot List here . 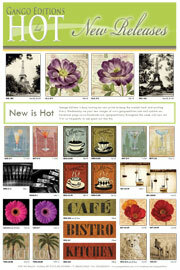 Keep coming back to the Design Lab for more hot themes!